I frequently am asked for advice on field scanning. One business owner recently asked me about plugging in a Neat Receipts scanner into field laptops. My gut reaction is that carrying another device with a laptop will not be very popular since it requires a flat surface and the time necessary to boot up the laptop and scanner. The best solution for scanning short documents in the field is to utilize a mobile device such as a smartphone. Since I carry an IPhone, I download and test all the mobile scanning apps. This review is for Genius Scan by the Grizzly Labs, and available for FREE on ITunes. Genius Scan is easy to use and capable. 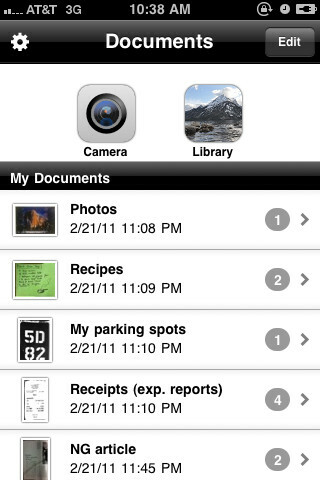 Documents are scanned by holding the camera over the document and taking a photo. The photo is then enhaned and converted to a PDF or JPG. Final files can be stored locally on your phone, emailed, or uploaded to your favorite document management app like Evernote or Dropbox. On a scale of 1-5, this software gets a 4+. I would like to see a mobile app that scans AND OCR’s. This is almost there, and as a free app, it’s terrific!